Is preparation for IIT or Medical a waste of time and effort? Is preparation for IIT or Medical a waste of time and effort? Is preparation for IIT or Medical a waste of time and effort? Why our youth is wasting important time and energy in preparing for IIT JEE and other entrance examinations? And why no one bothers about it? There are several arguments the questioner made in support of the question, or in his belief, that preparing for competitive exams like IIT and Medical is waste of time for students. This is my response to each argument one by one. First argument: Number of students suicides in Kota have increased in past few years. Absolutely correct. No exam is bigger than the life of a child. Suicides of students due to pressure is very unfortunate and the coaching institutes have to take blame for this. With so much pressure among the students, these institutes lacks proper counselling for the students. In many cases, parents themselves responsible for these incidents. They forced their ambitions above the interests of children. Which is a better option? 1) Stop everyone from competing in JEE, or 2) To make coaching institutes and parents of the students more responsible in understanding the psychology and mental condition of students during the preparation. Reason 1: The first option is not practically possible, unless you shutdown every entrance examination for engineering and medical. Reason 2: Understanding the psychology of students should be the moral responsibility of the coaching providers. Parents of these students should be more understanding and aware of any depression issues. Second argument: Some coaching institutes have IIT classes from standard 6th. When to start IIT Coaching is debatable, but there are cases where it helped the students to develop logical and analytical skills from young age. For class 8, 9 and 10, a foundation course can be helpful. The real intense JEE or Medical preparation generally starts from class 11th onwards. Third argument: Students have to learn Physics, Chemistry & Mathematics from very young age, instead the same time should be invested in R&D. Let me clear my stand at this point: I don’t think that youth is wasting its time in preparation of IIT, Medical or any other competitive examination. By including R&D in this, you are kidding me. These young children are not the best candidates for research and analysis. For that, higher education is the best place. If you speak to the students in IITs, those who are taking true advantage from these prestigious institutes, according to them, all this hard work during preparation is worth the effort. Do we have better options so that young students in schools can avoid being a part of this rat-race of competitive examinations? The demand for entering into the handful of top educational institutes is high. The competition of getting admission into top colleges can be reduced by raising the standard of other colleges and universities. But this is not what is happening. The new engineering and medical colleges are opening up without improving the existing ones. Are there any other alternatives for students and parents in this case? One thing we have to realize is, kids in our schools are not provided the right kind of environment to become creative from young age. Parents are also not helping in bringing out the creative side of a child. For them, it’s all about the performance and the marks. Sadly, it’s also the demand of our high school and secondary school education system. It will stay like this, if some magical reforms don’t happen. Till then, be a part of the competition at the right time. Work hard, clear exams, and experience the quality of the top education institutes. 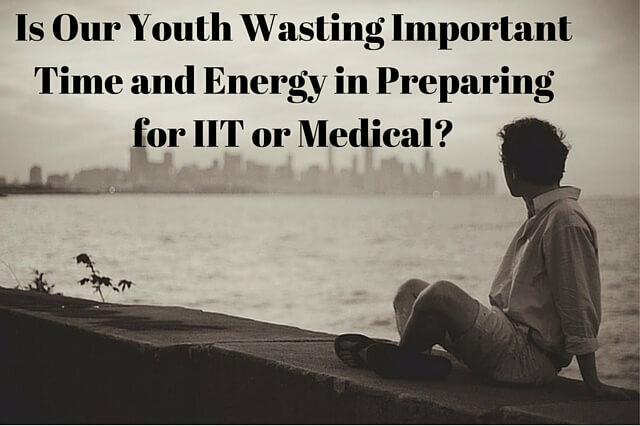 The IIT or Medical preparation is definitely not the waste of time and energy.